Traditional ruler of Kumbun community of Wase Local Government Area of Plateau State, Jessey Miri has raised the alarm that soldiers have killed more than 400 persons after invading three villages – Kadarko, Kurmi and Wadata. 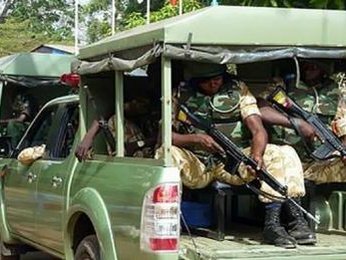 Acording to Miri, soldiers in over 40 trucks arrived the villages on Saturday following reports of alleged killing of four soldiers at Angwan Nanmi, Karin Lamido Local Government Area of Taraba State, a town that borders Plateau State. “We are still in shock over what the military did to our people. As I speak with you, the corpses of our people killed still litter the villages; scores of houses were burnt and some of the villagers were burnt in their homes, including children and the aged,” Thisday quoted the traditional ruler to have said in a telephone interview. Reacting to the allegation, spokesman of the Special Task Force (STF), Capt Ikedichi Iweha said there was no truth in the claim. According to him, following frequent attacks on communities around the Plateau-Taraba border by some militia, the STF and soldiers from the 3 Armoured Division of the Nigerian Army had been carrying out operations targeted at flushing out the militia. He wondered why soldiers working very hard to protect the people would now turn on them.